A nice long time in a smoker does a wonder for meats. 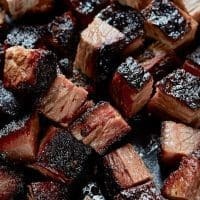 Keto poor man’s burnt ends are sure to please everyone, even non-ketoers! Two summers ago, my wife and I had just moved into a new house. It was a huge but welcome change from living in an apartment. Having some outdoor space (namely a backyard) was tremendous for us. While walking through Lowe’s one day, my wife suggested we get a smoker. I had never had one and had no clue how to use one. Heck, I didn’t even know what I’d make in one. It was actually a pretty easy decision to make and we got one. Fast forward a few months. I had used the smoker several times (not a lot of free time during the late summer and fall) but had little success. Either I cooked the meat too much and it was like leather. In most cases, smoking the meat for too long still resulted in not being done. One day, I ran across a recipe for poor man’s burnt ends. I gave it a try and what would you know. It was finally a success! 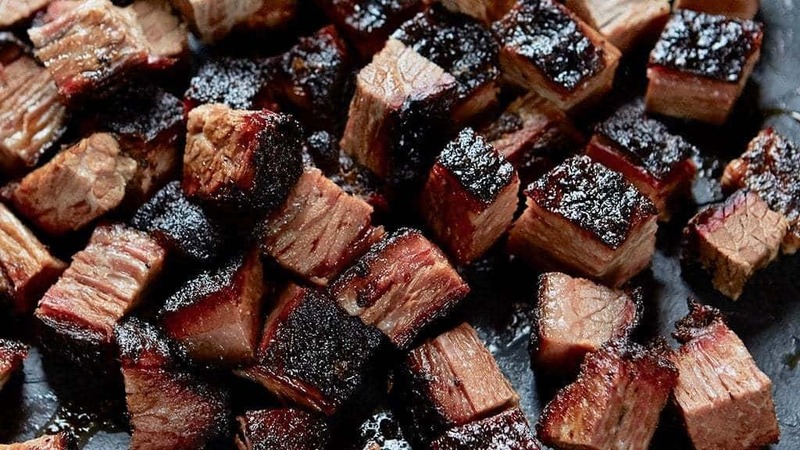 To make these keto poor man’s burnt ends, you will need a smoker (as mentioned above). There are some methods for smoking on a charcoal or gas grill. Otherwise, there is really no way to make this recipe work. Furthermore, if you don’t have a smoker, I highly recommend you get one. You can make so many great things in one, including an unorthodox recipe for smoked deviled eggs. If you love eating smoked meats at a BBQ restaurant, you can easily make them yourself at home. This recipe takes some time to make. I highly recommend you don’t try and rush it or speed the process along. Because of the time commitment needed, make sure you plan ahead to make this recipe a success. Make some coleslaw using our Keto Coleslaw Dressing for an amazingly tasty meal. Keto Poor Man’s Burnt Ends. Super delicious, super tasty, and super awesome. Lastly, make it. Love it. Eat it. Remove pan from smoker, serve, and love!